I have been in countless debates over the years with people about which alcoholic beverage is superior to the others in terms of depth of a subject. Usually, it centers around wine, beer and some or all form(s) of whiskey. I can bet that you know which side I was debating on. 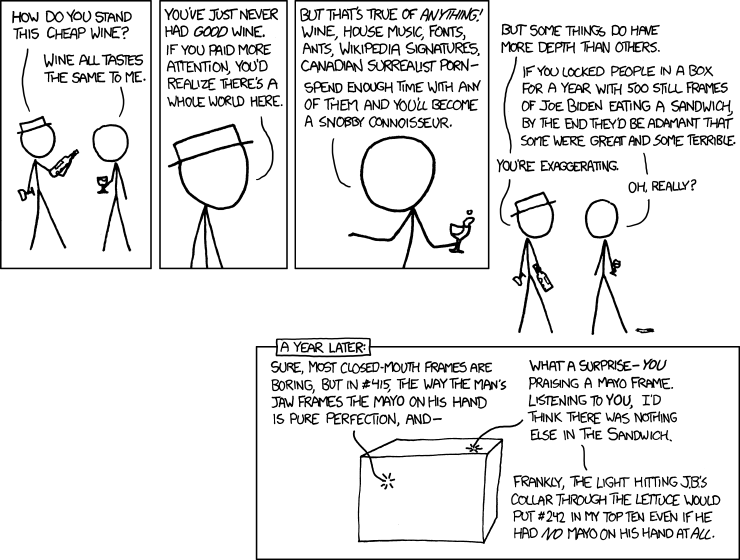 In reality, as aptly put in the comic above by Randall Munroe, if someone is curious enough and has the proper nerdy/geeky sensibilities, you can dive to bottomless depths of any topic (even “Blog Post Title Names That Sound Like Innuendos” if you so choose). For me, I tend to start down the path of curiosity of anything that catches my eye, but I seem to go the deepest with wine. I really, really like to know how things work. In wine, the trick to going deeper and weeding through all of the B.S. out there is wrapped up in the question: Why? If you can’t get a scientific answer as to why x causes y then you should feel free to remain skeptical. However, if you don’t pursue that answer to your question you either don’t care that much about the answer or are content in believing that someone is wrong without knowing in what way. Either of those options is a bit shallow if you ask me. The wine world needs more people asking why and then finding out answers when they aren’t content with the ones they are given. I could give you a million reasons why the topic of wine is worth the distance and I’ll give them too if you ask me, but the fact that you’re reading this is evidence that you’ve already found some of your own. All I ask is that you figure out what it is about wine that piques your curiosity and then start asking: Why? Wine, as a subject, is rather complicated and anyone who tells you otherwise is selling something. Is it ok to drink really cheap, mass-produced wines? Sure, if you like them, but some of us might equate that to you limiting yourself to the nursery rhymes you grew up with instead of giving the rest of the music scene a chance. Once you learn more about a topic, your reasons why you like whatever it is tend to change; you start to appreciate the quality of certain aspects of your subject. One only becomes snobbish about a topic when they cannot demonstrate why one example is superior to another and in what capacity. A snobbish persons also refuses to consider a person’s preferences into their demonstration. Don’t think I won’t continue rallying for the side of wine in the “Which has more depth to it?” debate. I will and I’ll win, because debates aren’t necessarily about who is actually right anyway. But for the sake of debate, for the sake of others listening to your conversations and most importantly, for the sake of yourself, don’t be content with just knowing you like something. Please ask: Why?